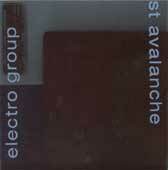 EvilSponge: Electro Group and St. Avalanche split 7"
This is a very promising 7" from Sacramento-based Clairecords. It features two bands from their town, although Electro Group is the only Sacramento band i have ever heard of before. In fact, i really enjoyed Electro Groups 2000 release A New Pacifica, which was a pleasant post-shoegazer pop album. Here are two new songs from the boys, and they do not disappoint. The first of their two tracks, Trauma, is a fast-paced flurry of guitars with charming singing overtop. A good pop song. The second tune, Mezzoforte, is more experimental. It is a lightly constructed cascade of piano and echoed guitar given a very light IDM-ish touch. It is, in fact, a very nice ambient number. The second side of this split is given to St. Avalanche, a band i had never heard of, but who are apparently into the "rock n roll lifestyle" seeing as on the liner notes they thank "St. Avalanche, for holding thier alcohol so well and never once OD-ing". Oh my. I would recommend this release to fans of quirky pop. Since it's a 7", it should be pretty cheap, and it's a good way to hear some interesting tunes.